Make a Statement with flags and signs! When Chevy Chase DC residents learned that Vice-President Elect Mike Pence was going to move to our neighborhood, more than 300 of us hung rainbow flags in a silent protest of his reactionary policies on LGBT rights. Signs for Planned Parenthood and NARAL, and against hate also sprung up across the neighborhood. Let's keep this movement going - in Chevy Chase DC and throughout the city. Let us know if you would like us to post information about other flags and signs. Please scroll to the bottom of the page - there is some cool stuff there! 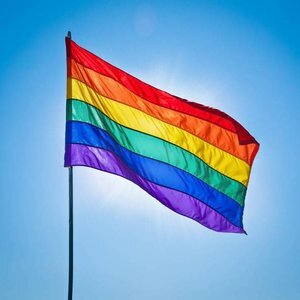 Rainbow flags are available from a variety of sources. Amazon sells flags at low prices. Here's one you can order for $5.95. Kengla Flag Company recently created a new flag that combines rainbow stripes with the Washington DC flag design. Very cool! The family-owned store is located at 4708 Wisconsin Avenue (near Chesapeake Street in Tenleytown). Check their website for store hours. We just have a few signs left. Contact nopeneighbors@gmail.com to purchase: only $8! When Pence's neighbors started flying rainbow flags to protest his anti-LGBT policies and actions, this simple act went viral throughout Chevy Chase DC. Now it is time to buy your own TRUMP BABY BALLOON! 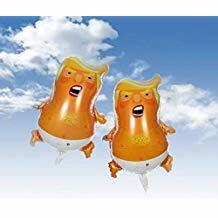 “Baby” versions of England’s Trump Baby Balloons are for sale on Amazon (click here for an example). Let’s stock up on them so we’ll all have our own balloon to fly when the right moment arrives! Will that be the day the Blue Wave takes over the U.S. House? The day Mueller releases his report? Impeachment day? All three??? Steve Behrens, a local resident who owns Birch Street Pictures, created this photo collage of Chevy Chase DC in full rainbow flag bloom. Download your own copy of the poster, and read his accompanying blog story at BirchStreetPictures.